Whether you want to kick back, relax, and enjoy nature’s tranquility, or are looking for outdoor camping and recreation activities, this state park has just what you need. Chewacla has camping facilities for RV, cabin, and primitive campers. A beautiful 26-acre lake for water activities and hiking and biking trails suited for beginner to intermediate hikers. A mix of modern outdoor amenities and renovated depression-era cabins combine to offer the perfect retreat from the hubbub of everyday life without the commitment to a full wilderness outing.Just 4 miles from Auburn, and a short hop off the interstate, Chewacla State Park is almost 700 acres of outdoor recreation in a tranquil setting that displays some of Nature’s best offerings. Abundant wildlife, a large variety of ﬂora and native trees, and an interpretive nature trail offer the nature lover a perfect setting for a day or weekend of relaxation. The 26-acre Lake Chewacla, Moore’s Mill and Chewacla Creeks, and the waterfall at Chewacla Creek Dam offer water activities that include: ﬁshing, swimming, canoeing, kayaking and even some whitewater paddling. The park’s close proximity to Auburn University also makes it an attractive weekend option for college football fans, and parents visiting their kids at the university. Constructed in the 1930’s as a Civilian Conservation Corp (CCC) project to provide jobs for the local labor force, Chewacla State Park still retains many of the original stone structures. There are 6 rustic stone cabins that have been completely renovated, and two group pavilions near the picnic, playground and lake areas. Modern campers will enjoy the three dozen sites with full hookups, and there are also 15 primitive camp sites for backpack and tent campers looking for a more roughing-it style camping experience. Showers, shelters, and comfort facilities are available to all camping areas. Picnic tables and grills are also scattered throughout the camps. Visitors on day-trips, and group excursions will appreciate the large group picnic area, also with picnic tables and grills, shelters, and a pavilion, adjacent to the playground and comfort stations. Just a few steps away is Lake Chewacla with a swimmer’s beach, and diving platform out on lake itself. Non-motorized boating, (canoes, kayaks, rowboats), is allowed on the lake, as is ﬁshing for some of the abundant big Bass, Bream, and Catﬁsh or Crappie. If the lake does not do it for you, there are two creeks to ﬁsh and paddle on. 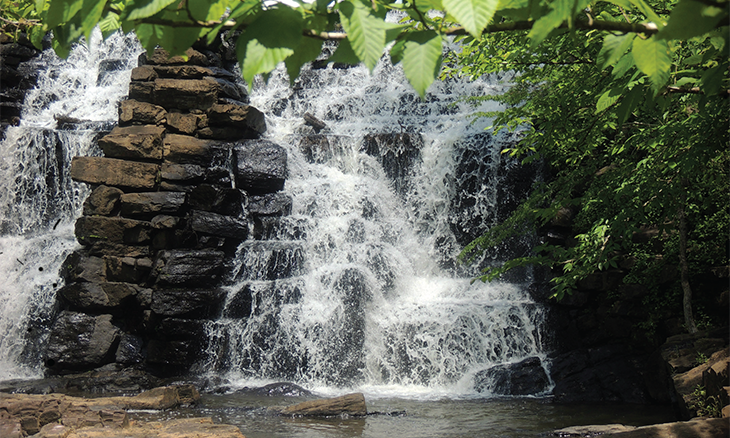 One of the main attractions for day-trippers and hikers alike is the Chewacla Lake dam, which created the 30-foot high Chewacla Waterfalls. Hiking at Chewacla has trails for all but the most extreme hikers. Eight trails, ranging from an easy interpretive nature trail, to youth and moderate trails wind throughout the park. The interpretive trail, The Sweet Shrub Trail, is the shortest and is incorporated as the ending point for several of the other moderate trails. The Deer Rub Trail has some of the steepest terrain and takes a little over an hour to hike. The park also includes the Mountain Bike Trail for some rugged two-wheeling fun. Most of the intermediate trails will criss-cross each other and lead to some of the park’s highlights, like its unique rock formations and Chewacla Falls. There is a paved trail, The Loop Trail, which also leads to Chewacla Falls for the casual hiker that appreciates a walk more than a steep climb. For pure nature lovers, Chewacla State Park trails offer some spectacular Fall foliage color tours that showcase Nature’s beautiful transition from Spring growth to winter slumber. An opportunity for unlimited “Kodak Moments”. With all its available outdoor camping activities: hiking, swimming, ﬁshing, and boating, and its day-visit amenities: the playground, comfort stations, pavilion, and picnic tables with grills, and the water activities at Lake Chewacla, Chewacla State Park is almost guaranteed to provide you with an outdoor experience you will remember for a long time.